Our venerable and God-bearing father Seraphim of Sarov was a Russian ascetic who lived at the Sarov Monastery in the 18th century, and is considered a wonder-worker. The Church commemorates St. Seraphim on January 2, and the opening of his relics on July 19. 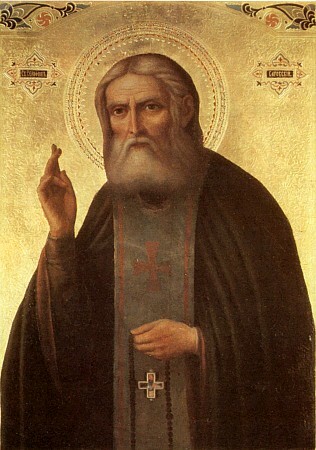 St. Seraphim was born Prokhor Moshnin on July 19, 1754. His parents, Isidore and Agathia Moshnin, lived in Kursk, Russia; Isidore was a merchant. At the age of 10, Prokhor became seriously ill. During the course of his illness, he saw the Mother of God in his sleep, who promised to heal him. Several days later there was a religious procession in Kursk with the locally revered miracle-working icon of the Mother of God. Due to bad weather, the procession took an abbreviated route past the house of the Moshnin family. After his mother put Prokhor up to the miracle-working image, he recovered rapidly. While at a young age, he needed to help his parents with their shop, but business had little appeal for him. Young Prokhor loved to read the lives of the saints, to attend church, and to withdraw into seclusion for prayer. At the age of 18, Prokhor firmly decided to become a monk. His mother blessed him with a large copper crucifix, which he wore over his clothing all his life. After this, he entered the Sarov monastery as a novice. From day one in the monastery, exceptional abstinence from food and slumber were the distinguishing features of his life. He ate once a day, and little. On Wednesdays and Fridays he ate nothing. After asking the blessing of his starets (a spiritual elder) he began to withdraw often into the forest for prayer and religious contemplation. He became severely ill again soon after, and was forced to spend most of the course of the next three years lying down. Prokhor was once again healed by the Most Holy Virgin Mary, who appeared to him accompanied by several saints. Pointing to the young novice, the Holy Virgin said to the Apostle John the Theologian: "He is of our lineage." Then, by touching his side with her staff, she healed him. His taking of the monastic vows occurred in 1786, when he was 27 years old. He was given the name Seraphim, which in Hebrew means "fiery," or "burning." He was soon made a hierodeacon. He justified his name by his extraordinarily burning prayer. He spent all of his time, save for the very shortest of rests, in church. Through such prayer and the labors of religious services, Seraphim became worthy to see angels, both serving and singing in church. During the Liturgy on Holy Thursday, he saw the Lord Jesus Christ Himself, in the form of the Son of man, proceeding into the Church with the Heavenly host and blessing those praying. The saint could not speak for a long time after being struck by this vision. In 1793, St. Seraphim was ordained a hieromonk, after which he served every day and received Eucharist for a year. St. Seraphim then began to withdraw into his "farther hermitage"—the forest wilderness about five km from Sarov Monastery. He achieved great perfection at this time. Wild animals—bears, rabbits, wolves, foxes and others—came to the hut of the ascetic. The staritsa, i.e., eldress, of the Diveevo monastery, Matrona Plescheeva, witnessed how St. Seraphim fed a bear that had come to him out of his hand: "The face of the great starets was particularly miraculous. It was joyous and bright, as that of an angel," she described. While living in this little hermitage of his, St. Seraphim once suffered greatly at the hands of robbers. Although he was physically very strong and was holding an axe at the time, St. Seraphim did not resist them. In answer to their threats and their demands for money, he lay his axe down on the ground, crossed his arms on his chest and obediently gave himself up to them. They began to beat him on the head with the handle of his own axe. Blood began to pour out of his mouth and ears, and he fell unconscious. After that they began to hit him with a log, trampled him under foot, and dragged him along the ground. They stopped beating him only when they had decided that he had died. The only treasure which the robbers found in his cell was the icon of the Mother of God of Deep Emotion (Ymileniye), before which he always prayed. When, after some time, the robbers were caught and brought to justice, the holy monk interceded on their behalf before the judge. After the beating, St. Seraphim remained hunched over for the rest of his life. Soon after this began the "pillar" period of the life of St. Seraphim, when he spent his days on a rock near his little hermitage, and nights in the thick of the forest. He prayed with his arms raised to heaven, almost without respite. This feat of his continued for a thousand days. Because of a special vision of the Mother of God he was given toward the end of his life, St. Seraphim took upon himself the feat of becoming an elder. He began to admit everyone who came to him for advice and direction. Many thousands of people from all walks of life and conditions began to visit the elder now, who enriched them from his spiritual treasures, which he had acquired by many years of efforts. Everyone saw St. Seraphim as meek, joyful, pensively sincere. He greeted all with the words: "My joy! Christ is risen" To many he advised: "Acquire a peaceful spirit, and around you thousands will be saved." No matter who came to him, the starets bowed to the ground before all, and, in blessing, kissed their hands. He did not need the visitors to tell about themselves, as he could see what each had on their soul. He also said, "Cheerfulness is not a sin. It drives away weariness, for from weariness there is sometimes dejection, and there is nothing worse than that." "Oh, if you only knew," he once said to a monk, "what joy, what sweetness awaits a righteous soul in Heaven! You would decide in this mortal life to bear any sorrows, persecutions and slander with gratitude. If this very cell of ours was filled with worms, and these worms were to eat our flesh for our entire life on earth, we should agree to it with total desire, in order not to lose, by any chance, that heavenly joy which God has prepared for those who love Him." The miraculous transfiguration of the starets' face was described by a close admirer and follower of St. Seraphim: Motovilov. This happened during the winter, on a cloudy day. Motovilov was sitting on a stump in the woods; St. Seraphim was squatting across from him and telling his pupil the meaning of a Christian life, explaining for what we Christians live on earth. "It is necessary that the Holy Spirit enter our heart. Everything good that we do, that we do for Christ, is given to us by the Holy Spirit, but prayer most of all, which is always available to us," he said. "Father," answered Motovilov, "how can I see the grace of the Holy Spirit? How can I know if He is with me or not?" St. Seraphim began to give him examples from the lives of the saints and apostles, but Motovilov still did not understand. The elder then firmly took him by the shoulder and said to him, "We are both now, my dear fellow, in the Holy Spirit." It was as if Motovilov's eyes had been opened, for he saw that the face of the elder was brighter than the sun. In his heart Motovilov felt joy and peace, in his body a warmth as if it were summer, and a fragrance began to spread around them. Motovilov was terrified by the unusual change, but especially by the fact that the face of the starets shone like the sun. But St. Seraphim said to him, "Do not fear, dear fellow. You would not even be able to see me if you yourself were not in the fullness of the Holy Spirit. Thank the Lord for His mercy toward us." Thus Motovilov understood, in mind and heart, what the descent of the Holy Spirit and His transfiguration of a person meant. "Where there is God, there is no evil. Everything coming from God is peaceful, healthy and leads a person to the judgment of his own imperfections and humility." "When a person accepts anything Godly, then he rejoices in his heart, but when he has accepted anything devilish, then he becomes tormented." "The devil is like a lion, hiding in ambush (Ps 10:19, 1Pe 5:8). He secretly sets out nets of unclean and unholy thoughts. So, it is necessary to break them off as soon as we notice them, by means of pious reflection and prayer." "It is necessary that the Holy Spirit enter our heart. Everything good that we do, that we do for Christ, is given to us by the Holy Spirit, but prayer most of all, which is always available to us." "A sign of spiritual life is the immersion of a person within himself and the hidden workings within his heart." "Excessive care about worldly matters is characteristic of an unbelieving and fainthearted person, and woe to us, if, in taking care of ourselves, we do not use as our foundation our faith in God, who cares for us! If we do not attribute visible blessings to Him, which we use in this life, then how can we expect those blessings from Him which are promised in the future? We will not be of such little faith. By the words of our Saviour, it is better first to seek the Kingdom of God, for the rest shall be added unto us (see Mt. 6:33)." "True hope seeks the one Kingdom of God and is sure that everything necessary for this mortal life will surely be given. The heart cannot have peace until it acquires this hope. This hope pacifies it fully and brings joy to it. The most holy lips of the Saviour spoke about this very hope: "Come unto Me, all ye that labour and are heavy laden, and I will give you rest" (Mt. 11:28)." "Oh, if you only knew what joy, what sweetness awaits a righteous soul in Heaven! You would decide in this mortal life to bear any sorrows, persecutions and slander with gratitude. If this very cell of ours was filled with worms, and these worms were to eat our flesh for our entire life on earth, we should agree to it with total desire, in order not to lose, by any chance, that heavenly joy which God has prepared for those who love Him." "When I am dead, come to me at my grave, and the more often the better. Whatever is in your soul, whatever may have happened to you, come to me as when I was alive and kneeling on the ground, cast all your bitterness upon my grave. Tell me everything and I shall listen to you, and all the bitterness will fly away from you. And as you spoke to me when I was alive, do so now. For I am living and I shall be forever." "The reading of the word of God should be performed in solitude, in order that the whole mind of the reader might be plunged into the truths of the Holy Scripture, and that from this he might receive warmth, which in solitude produces tears; from these a man is wholly warmed and is filled with spiritual gifts, which rejoice the mind and heart more than any word." "God is a fire that warms and kindles the heart and inward parts. Hence, if we feel in our hearts the cold which comes from the devil—for the devil is cold—let us call on the Lord. He will come to warm our hearts with perfect love, not only for Him but also for our neighbor, and the cold of him who hates the good will flee before the heat of His countenance." "The body is a slave, the soul a sovereign, and therefore it is due to Divine mercy when the body is worn out by illness: for thereby the passions are weakened, and a man comes to himself; indeed, bodily illness itself is sometimes caused by the passions." -- Spiritual Instructions. "Those who have truly decided to serve the Lord God should practice the remembrance of God and uninterrupted prayer to Jesus Christ, mentally saying: Lord Jesus Christ, Son of God, have mercy on me, a sinner." "When despondency seizes us, let us not give in to it. Rather, fortified and protected by the light of faith, let us with great courage say to the spirit of evil: "What are you to us, you who are cut off from God, a fugitive for Heaven, and a slave of evil? You dare not do anything to us: Christ, the Son of God, has dominion over us and over all. Leave us, you thing of bane. We are made steadfast by the uprightness of His Cross. Serpent, we trample on your head." and longing to work for Him alone thou didst struggle in the wilderness with constant prayer and labor. With penitent heart and great love for Christ thou wast favored by the Mother of God. Save us by thy prayers, O Seraphim our righteous Father. thou didst settle in Sarov Monastery. thou wast for many the way to salvation. and has enriched thee with the gift of healing and miracles. Rejoice, O Seraphim, our righteous Father. Prayer for Peace St. Seraphim used non-resistance to make peace. This page was last edited on June 9, 2014, at 17:40. This page has been accessed 142,892 times.